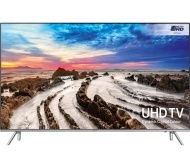 alaTest has collected and analyzed 335 reviews of Samsung UE49MU7000 Series. The average rating for this product is 4.6/5, compared to an average rating of 4.3/5 for other products in the same category for all reviews. We analyzed user and expert ratings, product age and more factors. Compared to other products in the same category the Samsung UE49MU7000 Series is awarded an overall alaScore™ of 93/100 = Excellent quality. If you're looking for something a little more special than your average TV, the Samsung UE49MU7000 might have caught your eye. It promises premium performance and design. Find out if our TV experts agree in our full review. Brilliant Gaming TV for the price range! very smart and easy to use, excellent sound! I looked on the web site for a 49 inch tv. I had pretty much decided on a particular model but after taking in the knowledge of a member of your staff I felt happy to change my decision and I'm very happy with the tv I ended up with.